Hopefully your ex-girlfriend changed the name of her device to make identification in the list easier, but if you just have several just named iPhone 4 or iPad then you may have to try with all of them one at a time. In my case I’ll be demonstrating it with my girlfriend’s backup (she’s not an ex and I have her permission), her name is Kim and you can see a backup of her iPhone and iPad from April 2012 but these could be considerably older depending on when the device was last connected. 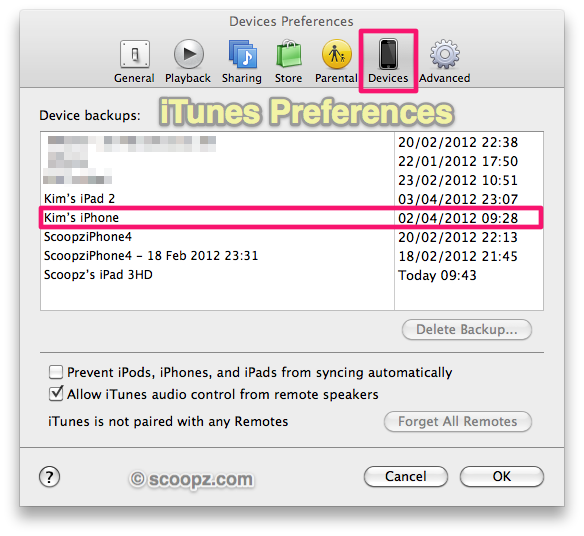 Select the backup you want to extract files from, in this case Kim iPhone and then hit choose. Now you will see a list of applications that were present on that device at the time the backup took place. Look for the one that belongs to the app you want to “hack”, in this case lets try Kim’s FaceBook app so I scroll down until I see com.facebook.Facebook and hot Extract. You will now be prompted for somewhere to extract the data to. 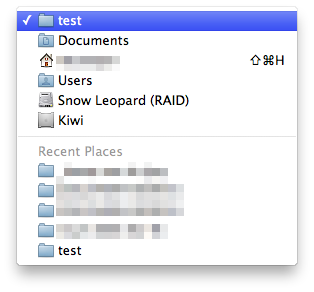 I just created a temporary folder called Test in my Documents and pointed it at that. This then extracts the com.facebook.Facebook plist file to your local computer. Now go and open the folder where you just extract the com.facebook.Facebook file to. 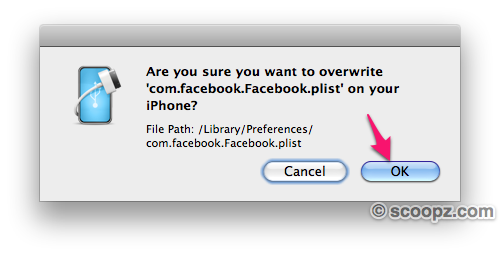 If you look in com.facebook.Facebook/Library/Preferences you should hopefully see a com.facebook.Facebook.plist. This is the file that has the key to get into their Facebook profile on any iOS device. 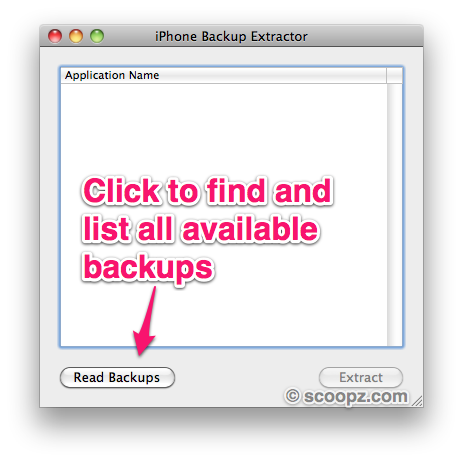 You are now done with the iPhone Backup Explorer/Extractor application and can close it. Important step: You need to completely exit Facebook app on your iOS device before proceeding, logging out of Facebook via the app is not enough. You actually need to properly quit the app. Simple way? Restart your iOS device. Method two, press the home button to show the home screen. Now double tap the home button to launch the recent apps bar and tap and hold on the Facebook icon in the bottom bar until they all wobble, click the delete icon on the top left to quit Facebook background app. The next step is to copy the extracted plist file onto your current device. The following steps are the same whether you are using Windows or OS X.
Download iExplorer for Windows, Linux and OS X here http://www.macroplant.com/iexplorer/ it’s FREE and a very handy app to have on your computer. 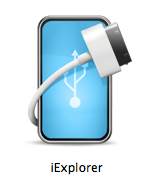 Once you have downloaded iExplorer connect your current iPhone/iPad to your computer via USB and quit iTunes if it automatically pops up and launch iExplorer. Your iPhone/iPad should show up in iExplorer and allow you to browse the contents of your device. 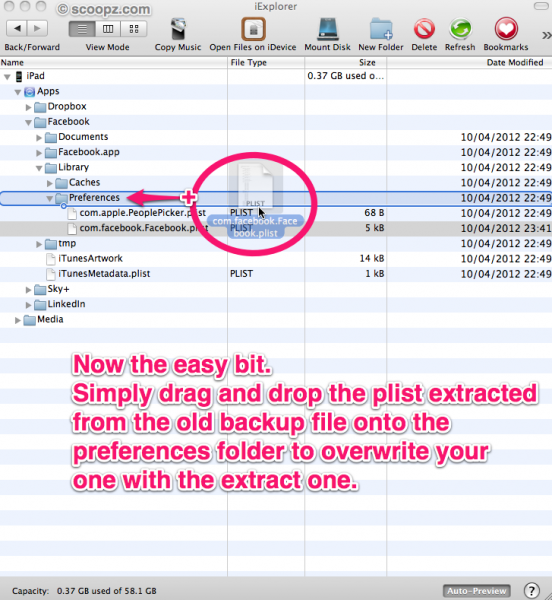 Navigate to the same folder on your device that you just extracted the plist file from. 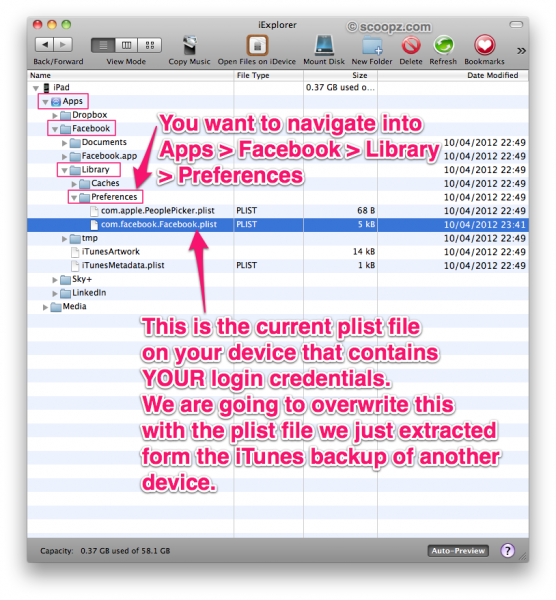 In the case of Facebook this is Apps/Facebook/Library/Preferences and you should see your plist file in there. For good measure you want to take a backup of your plist just so you can replace it when you are done. I copied my plist to my downloads folder temporarily. Next open up the folder where you saved the extracted plist from (Documents/Test in my example) and drag and drop the plist file onto the iExplorer window so it drops into the Preferences folder right on top of your existing com.facebook.Facebook.plist. You should be prompted to replace an existing file. Click OK.
That’s it, done! Now go to your iPhone or iPad and relaunch Facebook and basque in your evilness as you are automatically logged in as your ex girlfriend, wife, brother, sister, boss etc to do as you please. Disclaimer: This post is purely for informational purposes for those who want to see how the process works and how vulnerable apps such as Facebook are due to sloppy programming. If you want to protect yourself from having this happen to you then make sure you tick the option in iTunes to encrypt your iOS backups and avoid connecting your iOS device to any computers other than your own until the app developers re-write their apps to use keychain stores. You might be able to remove the access token via Facebook web page but the easiest way to ensure that your account cannot be accessed using this method is to simply change your facebook password. This will instantly render all old plist files useless. Once again note that the unsuspecting person who’s plist file you are extracting from the backup knew nothing about this. They did not have a jailbroken iOS device nor did they use a 3rd party app they simply connected their iOS devices to a computer and iTunes made a backup of that device. Thanks to Gareth Wright for finding the plist vulnerabilities and Satish B for his guide outlining how to extract files from iTunes iOS backups. Unfortunately not, Apple have made significant changes to security and how apps store data since this original post and exploit were discovered. To date I have not heard of any alternative method for hacking into Facebook or any other account on an iOS device. need some helping hacking into the Facebook account. I have a good reason for doing this and wouldn’t be trying to hack otherwise. I would be very thankful and appreciative if you replied to this message or emailed me back. Thanks. 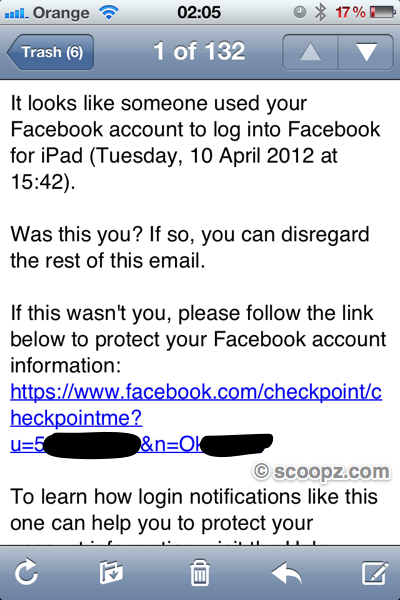 Hey scoopz, I need some helping hacking into the Facebook account. I have a good reason for doing this and wouldn’t be trying to hack otherwise. I would be very thankful and appreciative if you replied to this message or emailed me back. Thanks. Does this work if the plist I’m trying to copy onto my phone is from iOS 6 and my current phone is iOS 7? I went through all the steps and when I clicked fb on my phone, just the login page came up. @jmhuss – this post is now quite old (from 2012) and thankfully it would seem FaceBook has closed this loophole so unless you are using very old iOS versions and old FB app versions I think you’ll find this no longer works. Is there a way to use the plist to authenticate on osx? maybe extract the id or something to be able to use with cookie editor for firefox? 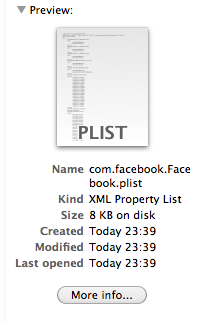 tldr: can i use the plist to access facebook from desktop? Help. This site is awesome. I did everything and got the file onto the apple device. when I open up the facebook app it shows my husband’s profile (id) which i wanted, but asks me for a password. What did I do wrong? i did all steps, drag and drop also. 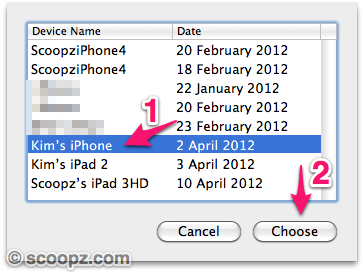 iphone 5 to iphone 4s doesn’t work..
Is it possible to do the same procedure with Skype..? some one used your finding to get 500$..
I’m not sure when the last time the linked programs were updated, so I’d also like to point out some more software to assist in reading iPhone backup data. Decipher Backup Browser (http://deciphertools.com) also translate the hashed (gibberish) backup file names into a readable structure, as well as translate some of the frequently-requested data (contacts, notes, voice memos) into a nicely viewable format. For me this only seems to load their login email address, but still prompts for the password. Has this been fixed by facebook now? Also is it possible to do something similar with a yahoo/hotmail account? Tried with iOS 5.1.1 and Facebook 4.1.1, no success. Security update? Having done this as a test, it does load the other profile on the new device but does not bypass the password. You still need the password to log? I have strong suspicion my wife Is cheating. She uses wats app frequently and msgs get deleted both on whats app and her iPhone too. JUST WANT TO KNOW THE TRUTH. After reading your article on Hacking the Facebook account. I urge u to plsss help me access her iPhone. CAN You help my Friend.? One thing to note is that this requires an iPhone backup; which would imply physical access to some degree. If you don’t have physical security, you can’t expect to any security. 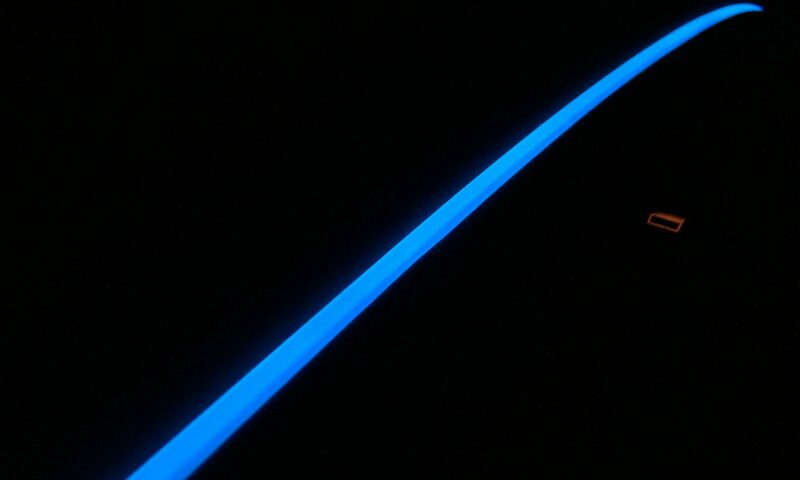 Just don’t leave backups of your iPhone on random computers :). i manage to do it only if the app was open and logged in as me…. i can see the other news feed roam into others friends etc…. but there that says the name of the owner it keeps says my name….. i can see my notifications and messages but roam the facebook as the victim….why? how it can be fixed and get full access?? ?